« What the Trees in Congo’s Forests Tell US. Driving from Newark to Manhattan we go past open dock yards of thousands of shipping containers. 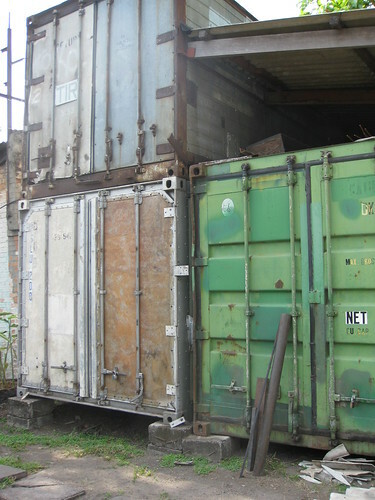 Similar containers get unloaded in Matadi, D.R. 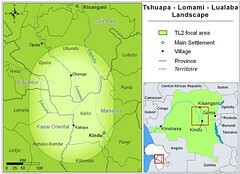 Congo, with the goods of missionaries, humanitarian agencies, international aid organizations and government ministries. From Matadi they move to Kinshasa by train and sometimes on again by barge into the forest interior. 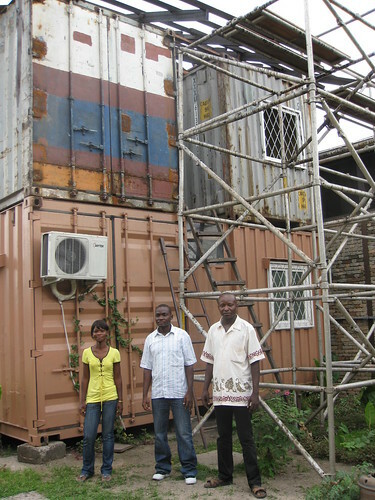 The usual presentation of shipping containers converted into Kinshasa storage. These are right behind my house. But a fair number get re-cycled in Kinshasa. Good friend, ex-Peace Corps teacher and 30 year Kinshasa veteran, Wally has recouped four to make into a two story building. We get the first story as our TL2 office building and have already moved in. Willy, our ‘Chef de bureau’ and finance manager enters through the front door. 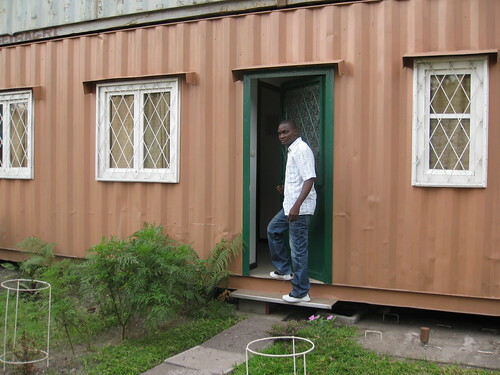 Our office is two containers broad and the complete staff is Bibyche, Willy and Michel. Original Congolese art on the walls, of course. The second story is not yet claimed and you would have a view of the Congo River! Make it a home or an office and Welcome. 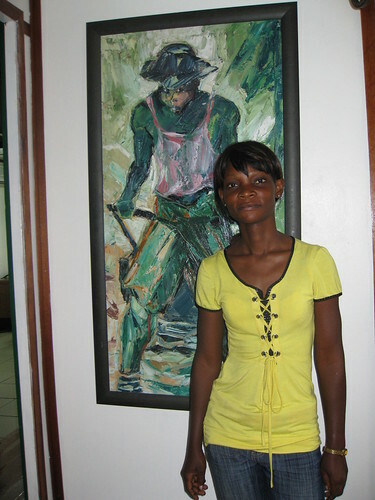 This entry was written by Terese Hart, posted on 2009-10-14 at 11:58 am, filed under About the project, Kinshasa. Bookmark the permalink. Follow any comments here with the RSS feed for this post. Post a comment or leave a trackback: Trackback URL. It looks a lot like the “mobile home” I live in here in the States. Hard to ventilate? I see the AC unit on the side. Plumbing? Aha — not a bad comparison. Right now plumbing is “0” as the water is turned off. Air conditioning, a must…. But there are other facilities on the parcelle and spirits are high. I love it mama! What a cozy spot. Is Georg allowed inside?